NEW ALBANY—The neighborhood was familiar to Archbishop William E. Lori of Baltimore when he arrived at 1216 E. Oak St. in New Albany to dedicate the museum in the childhood home of Cardinal Joseph E. Ritter. Both Archbishop Lori and Cardinal Ritter were natives of the southern Indiana city. David Hock, board chairman of the Cardinal Ritter Birthplace Foundation, recalled riding bikes with his childhood friend and Our Lady of Perpetual Help classmate, William Lori. The two kept in touch and, during one of the archbishop’s visits home, Hock asked him years ago for ideas on how to save Cardinal Ritter’s family home, which was facing demolition. Joseph Elmer Ritter was born in 1892, attended the former St. Mary School, and was ordained a priest for what was then the Diocese of Indianapolis in 1917 at the then-Abbey Church of Our Lady of Einsiedeln in St. Meinrad. Father Ritter was named auxiliary bishop of Indianapolis in 1933 and bishop of Indianapolis the following year. He became the first archbishop of Indianapolis in 1944 when the Diocese of Indianapolis was raised to the level of an archdiocese. In 1946, he was appointed archbishop of St. Louis and led the Church there until his death in 1967. Blessed John XXIII named him a cardinal in 1961. Cardinal Ritter was noted for desegregating Catholic schools in Indianapolis and St. Louis before such a policy became the law of the land. He also played a significant role in the Second Vatican Council. In the 1870s, the cardinal’s grandparents opened a bakery store on Oak St. in New Albany and his parents helped operate the business. In the 1890s, the family added the attached home where the cardinal-to-be and his five siblings grew up. In 1998, local historians identified the deteriorating building as the birthplace of the cardinal. The city of New Albany had condemned it and ordered its demolition. A group of volunteers, including Hock, appealed to the nonprofit Historic Landmarks of Indiana, which bought the property in 2002. The Cardinal Ritter Birthplace Foundation was formed in 2004, and fundraising began to rehabilitate the structure. 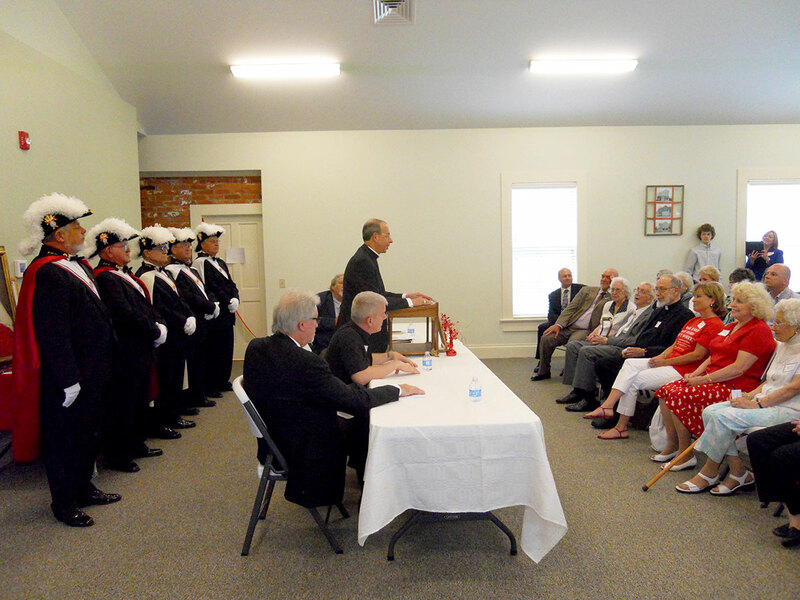 In 2007, the front of the house was renovated with a $220,000 grant from the Horseshoe Foundation of Floyd County, and a historical marker was erected with funds from Knights of Columbus Council #1221. Progress continued in 2009 when the city allocated $190,000 in federal Neighborhood Stabilization Program funds to the project. The same year, a park across the street was dedicated as Cardinal Ritter Park, with funding from the city redevelopment commission. In 2011, a community room was added at the back of the property. The Ritter House has four nonprofit tenants that occupy the former bakery at the front of the building. These include the Home of the Innocents, New Directions Housing Corp., ElderServe, and InfoLink of Southern Indiana. The newly completed museum room is the latest development in the effort to honor the life of Cardinal Ritter. A final project will be the installation of a rose garden in recognition of the cardinal’s love of gardening and his favorite flower, the rose. “Cardinal Ritter came and cut his own swath,” Archbishop Lori said. “What a pioneer he was in 1947, desegregating the Catholic schools, years before the Brown v. Board of Education ruling. It’s really easy, when you’re building parish after parish, to lose sight of the poor. If Cardinal Ritter were alive today, he would be Pope Francis’s kind of man. Archbishop Lori’s homecoming was a two-fold event. In addition to dedicating the newly completed museum room at Ritter House, he was the guest of honor at a reception hosted by Cardinal Ritter Council #1224 of the Knights of Columbus in honor of his 2012 elevation to archbishop. Archbishop Lori is supreme chaplain of the Knights of Columbus in the United States. Archbishop Lori’s parents, Frank and Margaret Lori, were present for the dedication. They are members of St. Anthony of Padua Parish in Clarksville. A 1965 graduate of Our Lady of Perpetual Help School in New Albany, Archbishop Lori was ordained a priest in 1977. He served as an auxiliary bishop of the Archdiocese of Washington from 1995 to 2001, when he was appointed bishop of Bridgeport, Conn. He ministered there until 2012, when he was appointed archbishop of Baltimore. Archbishop Lori cut the ceremonial ribbon to open the museum room and welcomed guests to their first look at the exhibits. Among the visitors were members of Cardinal Ritter’s family, including a first cousin of the cardinal, Helen Ritter, his niece Virginia Ritter Lipps, great-niece Mollie Garriott of Springfield, Ill, her daughters Maggie and Mary Caroline, and great-niece Kate Ritter Soave of Grand Rapids, MI.